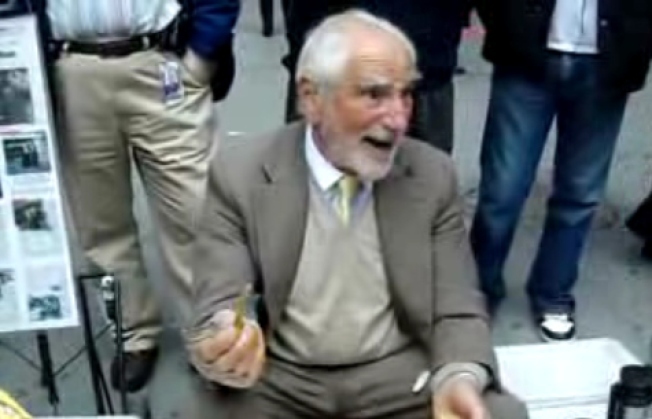 When veg-peeler peddler Joe Ades died last month, he left a gaping void in Union Square. This weekend his daughter Ruth appeared in his spot, carrying on his legacy. Joe Ades made his living $5 at a time. It was touching and not terribly surprising that when Joe Ades -- the beloved Vegetable Peeler Salesman of Union Square-- died last month, his passing was the talk of the town. In the days following the news, there was even a citizen-organized memorial held for Ades, in which New Yorkers brought a peeler and a vegetable of their choice to the spot where he plied his trade and peeled in mass tribute. This past weekend, a woman showed up, sat in Joe's spot, and began selling peelers. It turns out she's Joe's daughter, Ruth Ades-Laurent, carrying on the family business. For now, according to Gothamist, she's just selling off her dad's leftover stock -- but she'll order more once that runs out. If this story doesn't inspire a love for humanity, New York and vegetable peelers, you're just not right in the head.